Besides Tax Cuts For The Wealthy - What major domestic thing has trump accomplished? What major, MAGA domestic policy has Trump accomplished? He showed us how full of crap fiscal and social conservatives who support Trump are. PC culture has gotten worse under his watch. In his second year in office, the list of extraordinary things President Trump has done, for good and ill, continued to grow. Yes. Record numbers for blacks, for Hispanics and for women. 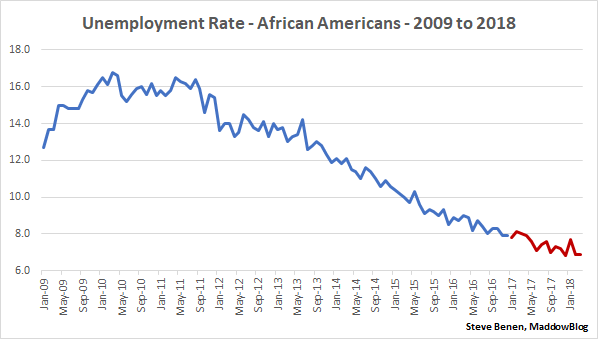 The highest employment ever for blacks and Hispanics and the highest in 50 years for women. In fact, there are more Americans working today than ever in the history of the nation. There are more Americans living today than ever in the history of the nation. Thanks to Trumps own personal Vietnam!! I remember in trumps 1st 6 months he was bragging about ONE MILLION jobs created. And his supporters ate it up. But they didnt do the math …167,000 jobs a month. But they heard the word MILLION and con trump sold it to them. 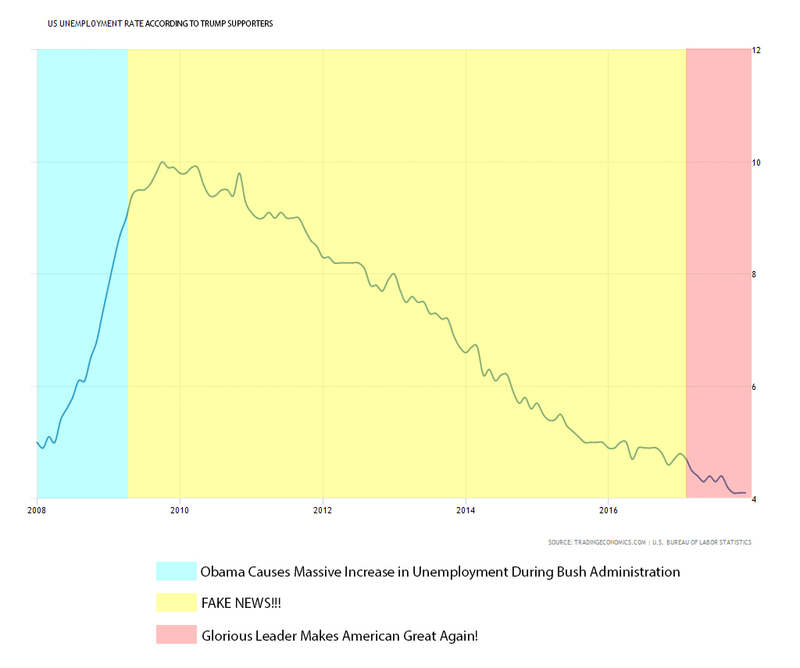 Just like the whole “record employment” ■■■■■■■■■ He inherited i think 4.8% unemployment. Hes dropped it by a little more than 1% as part of the same decade long trend. As you get closer to 1% unemployment it becomes increasingly HARDER to get full employment. It’s hillarious that the thing Obama could never achieve in EIGHT YEARS is somehow not enough for Trump to have achieved in two. 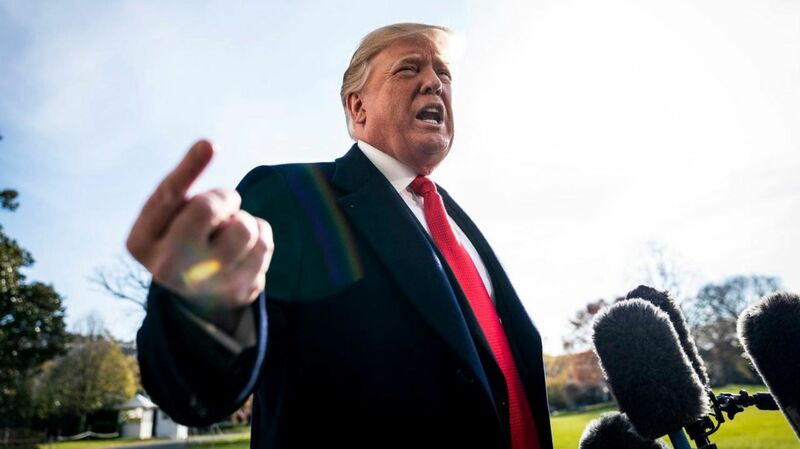 The simple fact is we have record numbers of people employed under Trump and there isn’t a damn thing you can do about it, but applaud his success. As you should, if you love this country and its people. Dude, just stop. Its sad. Obama inherited 800,000 jobs being lost a month and a financial crisis. Left office with <5% unemployment and <$500bil deficit. Since then trump, the same slope, dropped unemployment by about 1%, with no slope change, and also doubled the deficit and put spending back to 2009 levels. But I understand the trump cult will tell themselves whatever they need. Under Trump Americans have gotten OFF unemployment assistance and food stamps and disability, reversing a trend towards those things over the last several years. There is just no way to spin that as some kind of failure on his part. 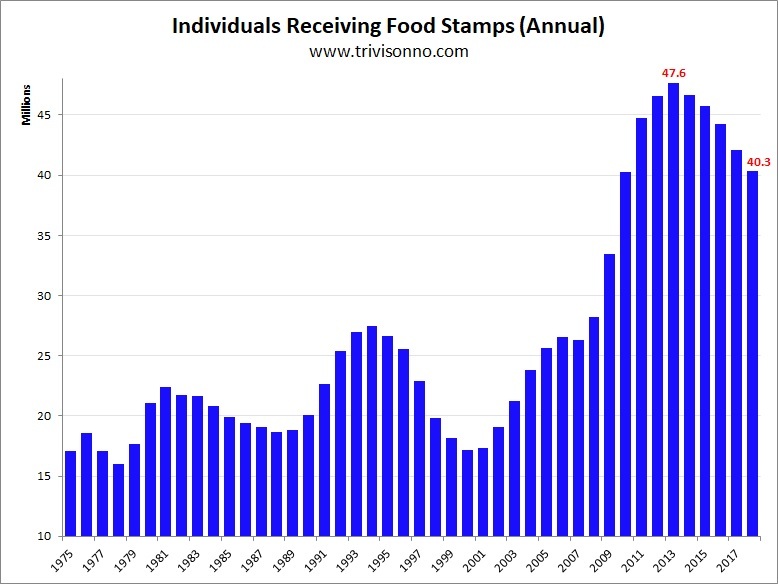 Food stamps have been decreasing since 2012. Do you get anything right? What’s sad is your inability to admit that Trump has gotten everything to get better, when everyone on the left was telling us what a catastrophe he would be for the economy. If you think running against this economy is a winner for 2020 Dems PLEASE DO IT!!! You’ve literally had every talking point shut down by facts and charts. Its really sad. trump did such a good job. He took a trend that was already happening and…continued it. So much better than Obama. It took Obama 8 years to get from 8-10% unemployment to 4.8%. It only took trump 1 day after he was sworn in to get there. Take that lib. Marky i didnt see you in the deficit doubling and spending back to 2009 levels thread. Why not? Oh and tax revenues are at a 4 year low. Think about that. The GOP gains control of everything, double the deficit, increase spending and decrease revenue…during FULL EMPLOYMENT. Good thing they no longer control the house. AGAIN, all I heard from the left and from the never-Trumpers is how his policies would destroy the economy. OBVIOUSLY that wasn’t the case at all. His economy is splendid and he will be running on it in 2020. Like the Dems are going to be fiscal hawks and reign in spending. DO NOT MAKE ME LAUGH. Let’s cue up the Green New Deal, for starters. Then we go on to free college for all. How about Medicare for all? Then let’s get into reparations…How about a multi-billion dollar train from LA to San Francisco? That was fun while it lasted, wasn’t it? Which doesn’t change the fact that he hasn’t really done anything.